“Le village des Puces” (Village free market) is a quarterly newspaper which is freely distributed in Saint-Ouen Flea market. This newspaper presents the different markets, the merchants, their shops and the items on sale. For example, an article on the Dauphine market was published in an issue of the “Village des Puces”, zooming in on the second hand shops. It presented models dressed in clothes made entirely from rags bought in Saint-Ouen Flea market. Use your week end to visit Paris/Saint-Ouen Flea market in northern Paris. 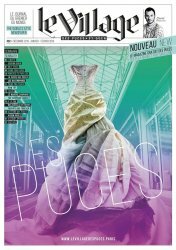 You will find there the latest issue of “Le Village des Puces”. Every issue of this newspaper is available in English and French on the “Village des Puces” website.